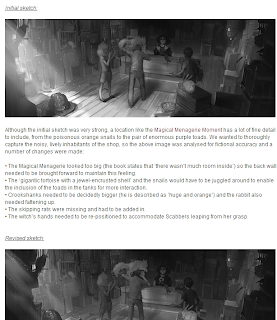 Pottermore posted a behind the scenes of the Moments of Pottermore on their blog, Pottermore Insider. In this post, they describe the process how a Moment of Pottermore is created. I got to know a lots of stuff, learn more about Pottermore, just you know, I love behind the scenes. We see they take good care of our baby, make it a fun reading experience and also nice points that they focus more on parts that were skipped in the films, being loyal to the description of the books, making it accurate as much as possible. I think it's a nice way so maybe for people start reading the books instead of only the films, I was just like the fans, always curious about how they did it and it's process.